As featured in The Christian Education Informer. While my spouse and I were still in the courtship phase of our relationship and dating, I discovered that she had an empty aquarium tank in her living room. According to her all of the fish had died, and she had not bothered to replace them. Overall, she found that the task of maintaining both the tank and its occupants was a little more time consuming and costly than she desired. This tank remained in her living room, empty and unused, for the first two years of our marriage. One day, I decided (since she would not allow me to get a dog) to buy some fish and put the tank to use. After getting the tank up and running, cleaning out the old decorations, and filling it up with freshly treated water, I made my way to the local Walmart to select some occupants for the previously abandoned aquarium. Once I arrived at the store, I purchased three small fish that were in the same tank: a little gold fish, some form of miniature shark, and a small black fish that I felt badly about leaving alone in the tank while carrying its friends to their new home. I carried the fish home, acclimated them to the tank, then released them from their plastic bag into what I believed was a supremely better environment than where they had been. Now, these three fish could spend their days and nights frolicking together in a custom home designed just for them. Little did I know that my assumptions about their future lives in my aquarium were about to be shifted! Returning home from work the next day, the little shark fish was gone. “Where did it go?” After scanning the inside of the tank for clues, the thought vaguely entered my mind that perhaps one of the two remaining culprits had eaten the third fish. Not quite sure about the mysterious disappearance, I said, “Oh, well,” and resolved to go on with my two remaining fish. The next day…. The gold fish was gone! “Okay,” I said to myself, “what is happening here? !” Looking at the lone black fish swimming around the tank, I thought to myself, “What kind of fish are you?” Returning to the store and questioning the person in the pet department, I discovered that the ‘small black fish I felt badly about leaving’ was an Oscar – and Oscars not only eat other fish, but they prefer to be in the tank alone! As the pet attendant informed me, my tank was new territory and the Oscar was claiming his space in a way that it had not in the Walmart tank. Once I understood that I had an Oscar and it required me to operate differently, I was prepared to adjust my expectations as the caretaker of the aquarium. So, what is the point of this recollection? Similar to the Oscar that was given residence in my aquarium, the Church of Jesus Christ often becomes occupied by persons who see the territory differently than those with whom they come in contact with inside of God’s tank. Whereas Pastors, ministry leaders and spiritual lay persons presume the church to be a place where all are welcome to serve in safety and acceptance, those who prey upon the unsuspecting, or see the church as their own distinct territory, develop predatory, self-serving tendencies which either close the church off spiritually from those who come seeking salvation in Christ or label the church negatively as a place of judgment and trauma for those who seek to live out the Great Commission in obedience to the commands of the Savior. How believers view the church in relationship to the expectations Jesus communicated plays a large part in the efficacy of our collective witness to persons who have yet to profess faith in Christ. While the church is a created environment, much like an aquarium formed from a collection of moving parts and distinctly molded elements, it is not an environment intended solely for occupation by the inhabitants. Indeed, churches and the people who comprise them were never expected to relegate themselves to useless, dysfunctional faith aquariums. Truly, the intent of the Church of Jesus Christ was to bring men and women into reconciliation with their Creator through faith in the sacrificial death of Christ the Savior, and ultimately to be the Kingdom of God in the world through the indwelling of the Holy Spirit. It seems, however, that somewhere along the way that message has been lost. In Chapter 7 of the Gospel of Mark, there exists a very practical contrast between the thought process of the Pharisees and the example of Christ in ministering to the needs of persons outside of the Jewish religious structure. Over half of the chapter, verses 1 through 23, is devoted to correcting the erroneous perspectives of the Pharisees whom Jesus reproaches for, “neglecting the commandment of God,” and holding “to the tradition of men.” Nit-picking the disciples for not washing their hands, a man made tradition among them, the Pharisees participated in a Jewish financial loophole, the declaration of Corban, to sidestep the command of God to honor their fathers and mothers (Exodus 20:12). The law of Moses required the Hebrew people to “honor” their parents. That term “honor” did not suggest mere “lip service”; it included the idea of caring for them in their various needs. Some of the Jews, however, had concocted a scheme to avoid parental responsibility. They would designate certain of their financial resources as “corban.” The Greek word korban is related to the term korban as, signifying the “temple treasury.” In Jewish practice, therefore, the word “corban” had been coined as a sort of “vow” term. According to the prevailing tradition, one could designate his financial resources as “corban,” which, practically speaking, was a way of “tagging” them, suggesting, “this belongs to God,” and thus was not to be used for personal interests. In the remainder of the chapter, verses 24 through 37, Jesus models God’s expectation for ministry and healing by performing miracles in the very lives of the Gentiles whom the Pharisees were ritually and figuratively “washing their hands of” through contrived ceremonial expectations: a Syrophoenician women seeking demonic exorcism for her daughter, and a male in the Decapolis who suffered from deafness and a speech impediment. Because of the faith exercised by these Gentiles, Jesus responded to their spiritual and physical predicaments, and created an opportunity for each of them to experience a practical change in their lives. Judging from the words and actions of Jesus in this chapter, one can easily conclude that the weightier matters of life – physical health and spiritual wholeness – are higher on God’s radar than man-made contrivances created to demonstrate public piety in the eyes of human observers. Also, it cannot escape our notice that Christ, our model of God’s compassion, did not confine himself to the homogenous affiliations, interactions, and expectations of Jewish cultural life, but in fact he walked in the expectations of His heavenly Father by challenging cultural, social, ethnic, religious and gender norms and becoming the very light of the world which shone into people’s personal dilemmas and delivered them from the darkness of disappointment, despair, disability, demonism, destitution, and disability. Though these issues (and their carriers) often make their way into our various houses of worship on Sunday mornings, the reality is they exist in even greater numbers among people in the highways and by-ways who have yet to know Christ in the pardon of their sins. No, God does not expect us to spend our time inside of our churches debating the relevance of sanctimonious trivialities, but like Christ we must head out into the world where people looking for answers to life’s troubles can find it through our testimonies of faith in the One who expected us to be both salt and light (Matthew 5: 13 – 16 NASB). JESUS’ EXPECTATIONS FOR THE CHURCH: BE FISHERS OF MEN! One of the peculiar aspects of Jesus’ earthly ministry was the general misunderstanding the Jewish religious leaders had towards Him and the actions He undertook. In fact, the contrast that is emphasized in the Gospels paints a very ‘Oscar’ like characterization of these persons who seemingly saw the formal religious establishment as an ‘aquarium’ meant for their control and occupation. Rather than seeing Jesus’ phenomenal miracles and teachings as reflections of the Father’s love and desires for His children, they persisted in questioning Jesus’ motives and antagonizing His followers. Clearly the expectations of these Pharisees were misaligned from those that came from the heart of God, and out of sync with the expectations Christ had for us as change agents of God’s love. What were Jesus’ expectations of us as the ekklesia, the called out family of faith commonly referred to as the church? In keeping with the thematic language of our focus, we can begin with THE challenge Jesus issued to His first disciples by the Sea of Galilee, “Follow Me, and I will make you become fishers of men.” (Mark 1: 17 NASB) Jesus expects His disciples, those persons living in the world to actively engage in the process of fishing for the souls of lost humanity. One of the problems modern-day believers have is failing to examine fully the various metaphors given in the Biblical text. Fishing today, like then, also involves tools and a specific process. The process of preparing to fish calls for the planning and gathering of needed supplies – rods, reels, sinkers, line, and hooks – prior to the task of fishing. In the planning and gathering process, one must also consider the type or types of fish one hopes to lure onto the proverbial hook. In other words, the bait that is used matters. Considering both the Biblical methods and the modern methods of fishing, one cannot escape the implication that fishing for human souls carries with it the aspects of thoughtful preparation, hard work, disappointing failure, and / or joyful success. Clearly, Jesus was not calling his disciples to a life of faithful passivity; rather His intention was for our lives to be spent in meaningful toil luring others into the very presence of Christ through the expectation of becoming united with Him both now and forever. 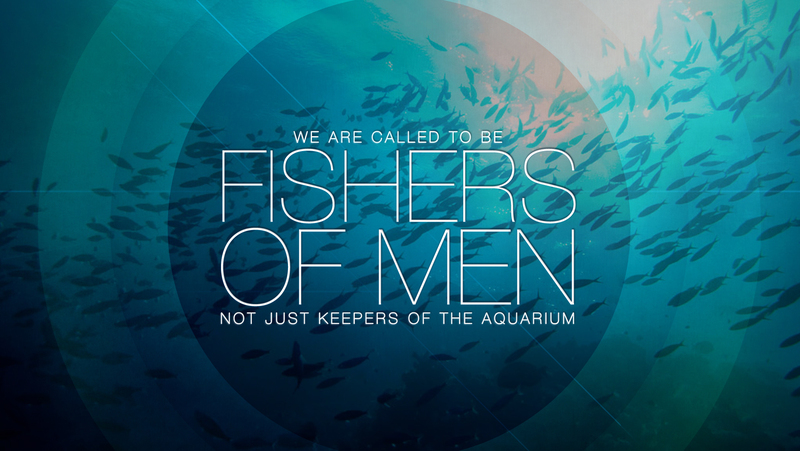 When a church operates like an aquarium, it really misses the expectation of Christ to bring persons into the Kingdom of God as fishers of men. This dynamic is easily noticeable in aquarium churches that fit the description of being a ‘closed school’ church. Rather than focusing its ministry efforts outside of the confines of the church, the ministry activities and experiences are mostly designed to occupy and / or entertain the members of the church, the proverbial ‘fish’ who already swim in the tank. This is a ‘closed school’ of member fishes: persons with long-standing memberships, historical family connections, and standing calendar dates for the ministry activities that have ‘always been done.’ As the member fishes make themselves content in the environment of their own creation, there is little growth, little change, and extremely little community impact. In the ‘closed school’ church, new persons experience difficulty integrating into the current ministries, and resistance from “gate-keeper fish” who actively erect barriers to anything that would be newly created and risk the church becoming open to any other fish that God or others might welcome into the territorial tank of the local church. This form of ‘aquarium dysfunction’ hinders the ability of the church to experience growth because anything that is closed must, over time, depend upon whatever spiritual and practical resources already exist within the aquarium, with few opportunities for those resources to expand. Like the two unfortunate fish in the introduction, people in the closed school church will disappear – some from natural causes and others from disconnection. Sadly, for the more unsuspecting new fish, they may be eaten alive by the Oscars of the church who cruelly re-establish themselves as the top of the food chain within the aquarium tank. Jesus never intended for persons to see the church as a closed, competitive hierarchy, but in the ‘closed school’ church, those seeking to find Christ often find themselves swimming in spiritually dangerous waters. Similar to the ‘closed school’ church, the ‘tank management’ church also serves as a model of ‘aquarium dysfunction’ at work in far too many local congregations. For ‘tank management’ churches, the concern is less about who comes into the membership and more about the ongoing logistics of operations and maintenance. As the pastor, leaders, and members spend their time fixated on budgets, giving percentages, maintenance, and operation costs, the real opportunities to reach beyond the well-maintained infrastructure into the surrounding communities are largely ignored. While no one would argue that buildings and assets grant churches a sense of stability and mark them as real landmarks in the vistas of the communities, the tragedy of a ‘tank management’ church is that the resources which are available to create tangible changes in the lives of people are regularly directed towards expenses that the church could realistically forego. Rather than paying $2000 a month for lawn maintenance to a private company, how many unemployed men in the church could benefit from an opportunity to earn money and resurrect their dignity through working for the church in their neighborhood? How many unemployed or stay at home mothers who cannot afford daycare could be employed by the church in a daycare operation that would bring the community together, while empowering women to supplement their income in the context of providing a safe-space for children to learn and develop? In the ‘tank management’ church, the dysfunction of the aquarium mindset promotes the welfare of buildings and material items over the welfare of people. All too often this mentality results in a beautiful ‘aquarium museum’ in the middle of the community, a monument to those who drive into the neighborhood for worship on Sunday mornings then leave again following the Benediction. The other result of this situation is a growing antagonism between the community residents and the church members; for those living in the surrounding area, the church might as well not exist if there is no realistic intersection between the church’s affluence and the plight of those living in the boroughs of brokenness. People are not helped by manicured lawns. People are not helped by stained-glass windows and churches closed to the public Monday through Saturday. But people do grow discouraged watching a weekly parade of church attendees drive in and out of their neighborhoods each Sunday in high-priced European sedans, while the surrounding community languishes in unemployment, addiction, poor health care, lack of affordable, nutritious food, and government neglect. For churches that model this form of aquarium dysfunction, diligent effort must be made to scale back the emphasis on resources, and apply more energy into addressing the real-world issues affecting the human beings in the churches geographical contexts – people led to perceive the local church as a dysfunctional gathering of insincere pseudo-Christians, seemingly more concerned with bricks and mortar than souls and salvation. The third model of aquarium dysfunction is the ‘SeaWorld’ Church. SeaWorld® opened its gates for the first time in 1964, founded by George Millay, Milt Shedd, Ken Norris and David DeMott. Originally planned as an underwater restaurant, the concept grew into a marine zoological park on 21 acres along the shore of Mission Bay in San Diego. With an initial investment of $1.5 million, 45 employees, several dolphins, sea lions, and two saltwater aquariums, SeaWorld drew more than 400,000 visitors its first year. Today, there are three SeaWorld parks in the U.S., including the original San Diego, Calif. location, and parks in Orlando, Fla. and San Antonio, Texas. Relying heavily upon business, corporate, and franchise methodologies, for the ‘SeaWorld’ Church, there is more interest in becoming ‘mega’ than meaningful. To some degree the ‘SeaWorld’ Church is similar to the ‘task management’ form of church dysfunction, but there is an important distinction. When ministries function as a ‘SeaWorld’ Church, they actually place the spiritual lives of seekers in jeopardy if there is little or no structure designed to move the ‘attracted fish’ from interest to discipleship. When the forty-person choir is silenced, when the captivating preacher has ‘closed’ the sermon, and the 90-inch HD monitors have gone black, is there anything of substance that will sustain the little lost fish throughout the week? The danger of a ‘SeaWorld’ Church is that right in the midst of the 10,00 member congregation, so many people are lost in plain sight. Christ never intended for His Church to become a celebrated Sunday morning side show; the church was meant to be the means of transformation for lost souls who would through faith become spiritual citizens of the Kingdom of God. I attempted to house a fish in an atmosphere that was actually counterproductive to its nature. I attempted to grow the aquarium atmosphere through my own inconsiderate ambition – and destroyed the first two purchased fish in the process. Bringing this situation to bear on the issues described above in the three models of church ‘aquarium dysfunction,’ there are several steps that we can consider to address the problems these dysfunctions produce, both by thinking about long-gone Oscar the fish and the lessons of The Master Teacher and our Savior found in in Mark 7: 6-8. As Jesus alluded to in quoting the prophet, persons interested in maintaining closed church environments suffer from hearts that have distanced themselves from God’s desires. Until the heart of someone is changed, their actions will remain the same. Simply put, a church body that has a ‘closed school’ mentality will never open their hearts nor change their habits of inwardly driven focus unless God touches them in a personal way and creates a spirit of repentance from self-motivated practices and concerns. For the Pastor who finds himself leading a church that fits this description, more attention must be given to the spiritual disciplines and practices of faith. Until the Holy Spirit breaks up the hard ground of self-centeredness, no shift can take place. To initiate this process, the pastor can schedule special prayer sessions with the leaders of the church. Also, events designed to highlight the needs of persons in the community can be hosted. As an additional resource, the pastor can tap into church members in the social services field and ask them to share some of the initiatives being enacted by their particular agencies. Lastly, the pastor can begin a personal prayer campaign, calling or visiting each member of the congregation to share his or her concerns, then praying individually with them. Like the proverbial mustard seed of faith in the Scriptures, believers can move mountains of obstruction and closed-mindedness when they allow the Holy Spirit to have its way in the midst of ‘closed school’ aquarium dysfunction. For the Oscars swimming around in our aquarium churches, the Holy Spirit must change their nature so that they can accept the new parameters of living in a fish tank that is no longer their own exclusive territory. In ‘Tank Management’ Churches, where ‘aquarium dysfunction’ takes the form of prioritizing assets over people, measures must be taken to help people reflect on the human casualties of their fixation with property and resources. If the majority of persons in the church have committed themselves to maintaining the building site, to the detriment of the human beings who require spiritual attention, then measures must be taken to help people re-think and reevaluate the importance of people in their own lives and the life of the church. With ‘Tank Management’ dysfunction, the hearts of the people are open for the things of God – but only as expressed through that which is tangible and manipulative. One method of shifting the focus of persons in these aquarium-minded churches is to subtly remind them of the interpersonal losses that have transpired in the church; this can be done through visuals, data, and presentations about membership transfers, deaths, old photographs from past events, etc. As persons embrace the realization that many of the faces of yester-year are no longer present, and the stark reality that their friends, children, and grand-children have relocated to churches that do not resemble aquariums, gradually it will begin to dawn on them that unless there is an intentional focus on the people of the church, the physical and fiscal assets will no longer matter. As I realized with Oscar, what good is there having a well-maintained aquarium for only one fish? In ‘SeaWorld’ Churches, aquarium dysfunction drives the church to egomaniacally obsess over size, spectacle, and public opinion. Regardless of the actual effect on people, or the lack thereof, a ‘SeaWorld’ Church tends to value the quantity of so-called relationships versus the quality of genuine interactions with those who come seeking a life in Christ. For the Church Leader who must struggle against his own desire to have the biggest and brightest Sunday morning service, the shift in the aquarium must begin with you. Only when the leader acknowledges that prioritizing raw numbers over raw impact is spiritually unacceptable will the aquarium dysfunction begin to dissipate. As the Pastor begins to emphasize relationships over church attendance, and spiritual growth over marketability, the church will discover that even though some of the initial numbers may dwindle, the net result (pardon the pun) will be persons who are drawn into the presence of the church members and who are open to experiencing a genuine, qualitative relationship with Jesus Christ through the sincere interactions discovered in the church context. In closing, I need to say that the time that I had raising and caring for Oscar the fish was quite memorable. As he grew larger and larger, he would thrash around the tank when visitors came by, and he became quite a conversation topic among my close friends who would inquire, “How many goldfish did he eat this week?” However, the indelible spiritual lesson that I drew from my time with Oscar is this: nothing lasts for long in a situation of dysfunction. Even though it may look acceptable, and we find ourselves making excuses and adjustments in order to mentally and physically accommodate the discrepancies, the truth is that for things to be effective they must be allowed to operate the way their Creator intended.